I work some in the eighteenth-century but tend to find it tiresome because this epoch more than any other gives rise to scholars who obsess over small details and like to argue about them. One of these is--ahem--the origin of the "shrubbery". Say it with me: "shrubbery". Now say it five times fast. shrubberyshrubberyshrubberyshrubberyshrubbery. That's how it feels to be in a room with shrubbery scholars. I KNOW! Like you, I thought shrubbery was invented by the Knights who say Ni! Au contraire, mon frère. You have much to learn. "Now think of the gaiety of a Shrubbery ! —unlike to the monastic melancholy of the old wood walks ; and herein you may plant all the neat trees I have before mentioned, with ponds at proper distances, for gold fish, and benches with Latin mottos—to puzzle the ladies; besides temples dedicated to the heathen gods!" Just think of it! Goldfish! Heathen Temples! Puzzling Ladies! Do read the whole of Horace Walpole's satire of the "Modern Taste" in gardening, c. 1780 here; it's only a page long, with f's for s's adding to its delight. Or this of the shrubbery at the Leasowes, c. 1775: "The scene now changes to an open lawn, where the path waves up to the house and shrubbery, laid out in taste, and agreeably bushed by clumps of evergreens and flowering shrubs; a small lawn in the midst, has a statue of Venus, well executed, and the pedestal gives us these beautiful lines..."
and a helpful summary is the description of the poet William Cowper's landscape at Weston (c. 1793): "The shrubbery..was very generally admired, being a delightful little labyrinth, composed of flowering shrubs, and adorned with gravel walks, having convenient seats placed at appropriate distances." So. Mixtures of evergreens and deciduous flowering shrubs arranged in a 'theatrical' style (by height, basically) adjacent to open lawn, winding walks, appropriately placed features to engage the eye, inspire the mind, and rest the body...that's basically it. But the real reason I'm wading into the discussion of shrubberies--where believe me angels fear to tread--is to point out the usefulness of a new google tool for historians, garden or otherwise. 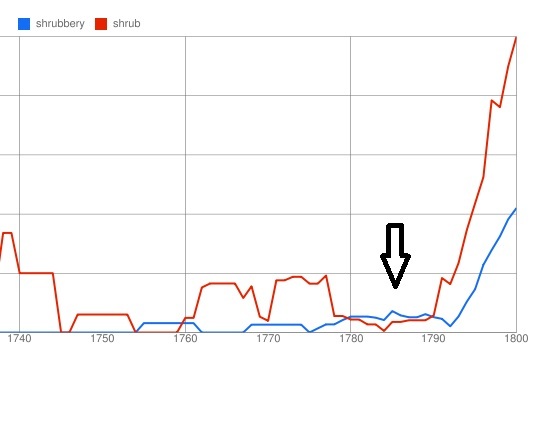 You can see that the word 'shrubbery' is basically non-existent prior to 1750 (okay, there are five references listed 1700-1750 but I know all of them to be misdated; you do have to watch Google on the early dates), with budding usage 1780ish (note the above references), and then really takes off in the early 1800s, which is basically when widely-published J.C. Loudon begins to not only codify the shrubbery as a garden feature, but to use the word as an alternate for 'shrub'. That is the most obvious origin of the word, and so it is tempting to think it was just a simple linguistic analogue. 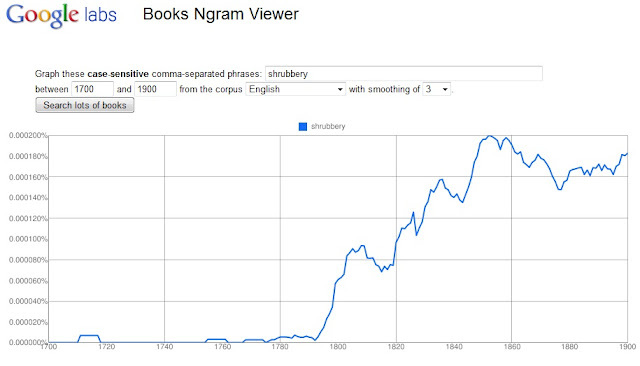 But here again the Ngram can help, because it can show two words at once. I've confined the data in this set to between 1700-1800 so it isn't compressed by the huge spike in the nineteenth century. 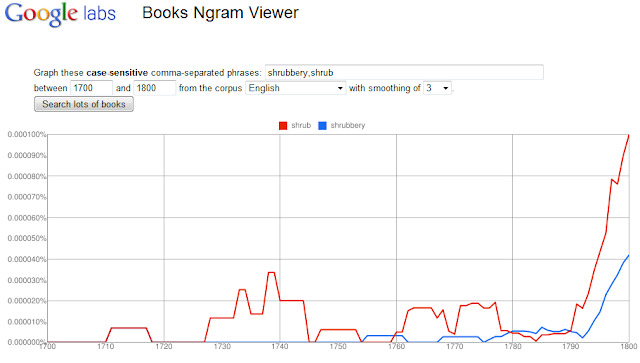 It indicates a lack of correlation between the words, with 'shrub' (the plant, in red) clearly pre-dating 'shrubbery' (the garden feature, in blue), which in its time would have been New Word of the Year! like 'bromance' or 'webinar'. Or 'culturomics'. Note especially that 'shrub' usage actually drops BELOW 'shrubbery' usage between 1780-1790, the critical period for shrubberies and the approximate dates of the references I've quoted. Just 10 years. What do we have here ladies and gentlemen? A fad. If you're saying things like, "but how is this affected by the increase in number of books published", then you have the mind of a scientist and you'll be happy to know that Google normalizes by the number of books published per year. But also the data from the graph can be downloaded as csv files and corrected for any number of variables. This is so cool. UPDATE: Alert reader Adam has pointed out that this can also be affected by OCR errors, especially because of the whole 'is it an f or an s' issue in page scans of old literature. I did make the assumption that such errors would affect 'fhrubs' and 'fhrubberies' equally; to do otherwise would require examining the individual files. Snap. 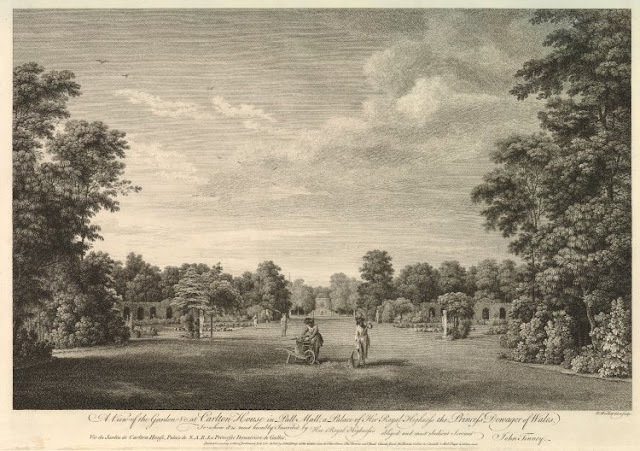 As soon as I heard about this I also used this tool for words relating to garden history: 'clumps' for instance, and of course had to try picturesque/Picturesque, c.1660-1860. I agree very cool. This looks like hours of fun - thank you! But hasn't the term 'N-gram' already been appropriated by Scientology? Is google just making a big joke? Ha! I had never heard of the Scientology ngram! But this new Google search is a great tool for landscape historians. I can imagine using it for all sorts of research - plant names, stylistic terms, even designers, to see how fads wax and wane. Wait til I tell my husband about this new Google thing. It is so hard to keep up. He is my IT person and now I'll have to figure out a way to use this on my blog. I love visiting you!